SIS Summer Abroad 2009: Malaysia: I am a Food Tourist...and I love it! 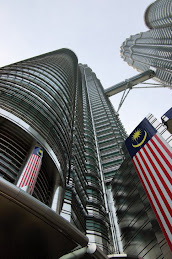 Before I came to Kuala Lumpur, I tried to picture what it would be like. I had seen some ads on TV proclaiming Malaysia to be Truly Asia. I have to say, for a country that's slightly larger than New Mexico, and with a population of only 25 million, it is an amazingly diverse place. Malays, Chinese, and Indians form a potpourri of cultures that is not only a visual feast, but a delicious amalgamation of tasty food. I had never thought of myself as a 'foodie', but here I am in Malaysia, sampling all of the regional delicacies with relish (as well as a bulging stomach). We've been to Penang, the renown food center of Malaysia. Hawker stalls, or street food, is a cheap and sumptous way to fall in love with this city. Char kway teow, or fried flat noodles, are a local specialty, and definitely worth a try. Melaka, the ex-Portuguese, ex-Dutch, and ex-British settlement (due to its strategic importance in the Straits of Malacca, but that's digressing...), is a wonderful place to sample Baba-Nyonya cuisine, which is a mix of Chinese and Malay food cultures. Professor Heng took us to the famous Nancy's Kitchen, where homestyle nyonya food is served, and is highly recommended. Cendol, a shaved ice treat, is a must-try in Melaka. Our trip to Borneo was highlighted by the Rainforest Music Festival. What Crystal left out, however, was the many eclectic food options in Kuching, Sarawak. This eastern part of Malaysia is characterized by a wonderful mix of Malay, Chinese, and indigenous peoples, all in a relaxed social atmosphere. Religion and ethnic differences are not the dominant force in daily interactions as on the mainland, especially KL. I was pleased to find pork satay here, a Chinese (and certainly non-Halal) form of the skewered meat enjoyed throughout the region. All this talk of food has definitely worked up a hunger. Until next time- ciao et bon appetit!